Inventory Reports are printable reports for different stages of Inventory, as well as reports for pricing. 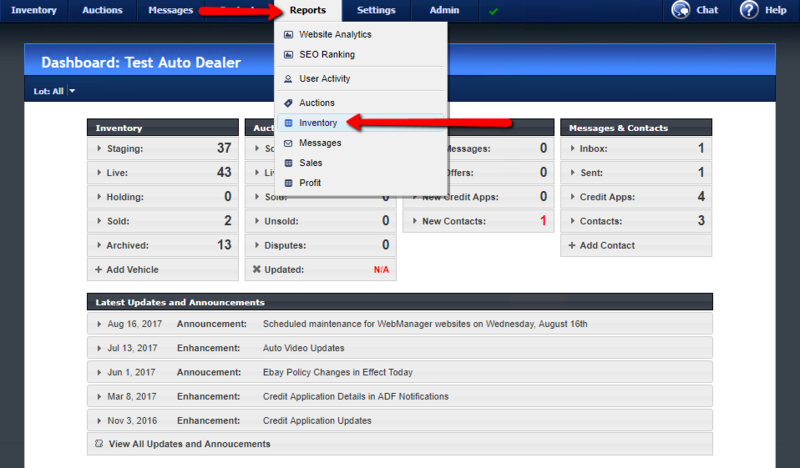 To access the Inventory Reports, hover the mouse over Reports, then click Inventory. The Inventory Reports are designed to be an internal cheat sheet for your sales people to keep track of inventory. Each section will provide you with a printable version of that category’s inventory (e.g. Live Inventory Report will display all live vehicles). The Pricing Reports are designed to display the advertised price of vehicle’s currently for sale. The advertised price is the Internet Price, if available. Otherwise, it is the show room price. The reports were designed to be displayed to customers.